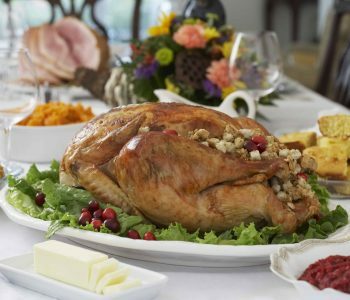 There is no bigger challenge to your diet than those fourth-quarter holidays: Thanksgiving, Christmas and New Year’s Eve. Between Thanksgiving, Thanksgiving leftovers, office Holiday parties, Christmas bake sales, New Year’s Eve revelry and New Year’s Day bowl games, you face a two-month shmorgishborg that could knock you off your weight-loss plan till spring – and that doesn’t even include all that leftover Halloween candy. Fortunately, with a little knowledge and planning, you can have a festive holiday season and still fit into that new ugly sweater Aunt Rose knitted you for Christmas. Eat before you feast. Rather than starve yourself in preparation for a holiday feast, eat a good breakfast high in fiber. If you get hungry during the day, have a healthy snack. That way you won’t overdo it later on stuffing and pie. It’s also a good idea to start the day with a jog or walk. Focus on family, not figgy pudding. The holidays are a time to rejoice in friends and relatives. Concentrate on catching up with people you love rather than digging into those Christmas cookies. If you are tempted to go back for seconds, take a short walk first. You may realize you’re not hungry after all. Plan an active holiday event. No matter what the weather, there are fun holiday activities that don’t involve eating. Take a nature walk, organize some carolers, or participate in winter activities such as skating, sledding and skiing.